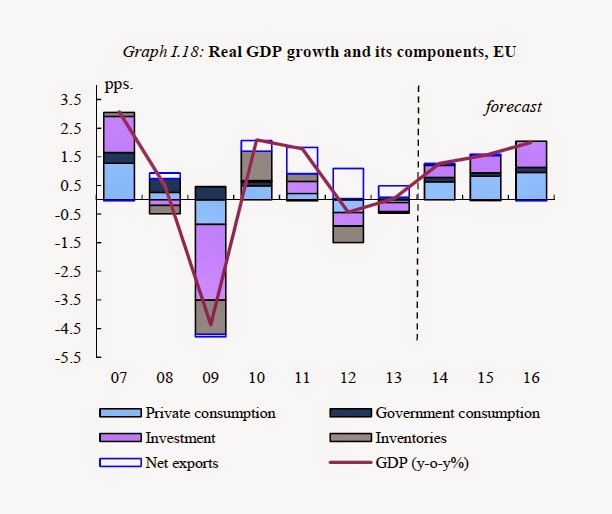 The European Commission has this morning released its Autumn 2014 Economic forecasts. While these forecasts can often be quite mundane owing to the very managed message they are trying to send, this set look to be a bit different (see here for our take on Winter 2014 and Autumn 2013). Maybe unsurprisingly the tone to more sceptical, critical and possibly realistic. Below outline some interesting themes. Once again growth for the Eurozone has been revised down. The previous forecast saw 1.2% and 1.8% growth in 2014 and 2015 respectively. The new forecast predicts 0.8% and 1.1% respectively, quite a significant downward revision, especially since growth next year is now expected to be below the original forecast for this year. The initial blame (in the press release) for this revision seems to be laid at the feet of “increasing geopolitical risks and less favourable world economic prospects”. However, that raises the question of why it is seen as enduring up to 2016. In the report itself the assessment is thankfully more candid highlighting “incomplete internal and external adjustment” and “low productivity gains”. There is a wider acceptance in these forecasts that unemployment will remain elevated for some time and that differences in labour market performance will persist. That said, at the moment any real prospect on employment growth in the Eurozone seems optimistic. France and Germany’s growth prospects for this year have been revised downwards to 0.3% and 1.3%, from 1% and 1.8% respectively. Italy is expected to contract by 0.4% this year and only grow 0.6% and 1.1% in 2015 and 2016 respectively. Given that these three countries account for nearly 60% of Eurozone GDP this suggests a very poor outlook for the Eurozone with growth risks tilted to the downside. In general, the core vs. periphery split is less clear in this report, at least in growth terms as many countries are now acting as a drag on the Eurozone economy for a number of reasons. Early on in the crisis there was a clear focus on facilitating export led recoveries, often in the German model. However, over the past 12 – 18 months this has shifted, possibly driven by global economic weakness, and these forecasts finalise the shift. The Commission itself says, “Net exports are likely to contribute only marginally to GDP growth over the forecast horizon”. Spain is a prime example of this, see here for a longer discussion of the issue. While finding a balance between the two is important (we cannot have 18 Germanys in the Eurozone) the shift may have been too stark. Let’s not forget that there is still a huge amount of public and private debt (both household and corporate) in the Eurozone, especially in problem countries. This will limit potential domestic demand growth. So while the flows are shifting in a way which should see an uptick in domestic demand, we should not forget that the huge stock of debt may provide a ceiling on this as a driver of growth. The Commission has also downgraded its inflation forecast with CPI expected to be 0.8% in 2015 compared to previous forecast of 1.2%, while it is only expected to be 1.5% in 2016. 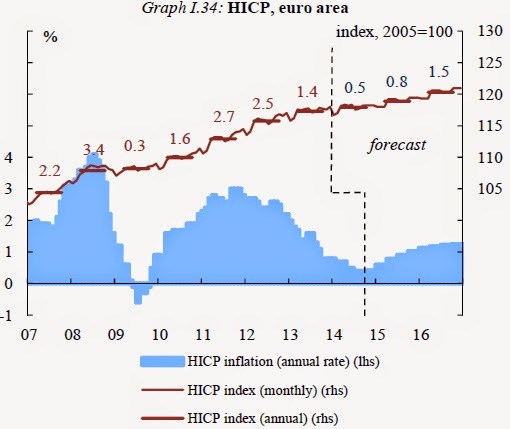 The forecast for 2015 is below the ECB’s of 1.1% but the 2016 is above the ECB’s which is 1.4%. Interestingly, the Commission continues to make the case that “low, or negative, inflation rates as part of [some countries] inevitable adjustment process”. This is an argument which has been absent all recent ECB press conferences. In terms of deflation, the Commission sides with the ECB, saying the risks of outright deflation remain low. We’ll update the blog throughout the day as we pour over the 185 page report. But for now, we’ll leave you with a thought from Commissioner Jyrki Katainen in the press conference, when asked how much the forecasts can be trusted given a history of being incorrect he simply responded, “Nobody knows”. Quite.